Our Golf Pro Shop at Moor Allerton Golf Club, stocks a wide range of apparel, hardware, golfing GPS units and electric trolleys, plus all of your golfing basics. We also have a dedicated ladies department. 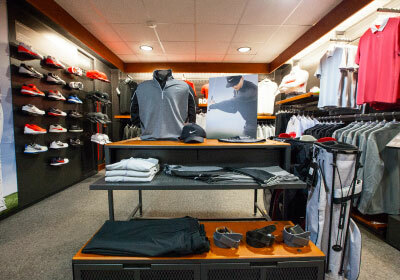 The golf shop stocks a variety of apparel brands for men and ladies, including premium brands such as JLindeberg, Hugo Boss and Galvin Green, as well as golfing greats like Glenbrae, Nike Golf and Footjoy. Ladies are well catered for at JWhitaker Golf, with a choice of brands including Galvin Green, Nike Golf, Green Lamb, Rohnisch, Daily Sports and Glenbrae. Hardware is the focal point at JWhitaker Golf, with the pro shop stocking all the latest clubs from leading manufactures including Nike, Titleist, TaylorMade, Ping, Callaway, Mizuno and Bridgestone. All clubs, from Driver to Putter can be trialed and fitted in our state of the art JWhitaker Golf Performance Centre on a no obligation to buy basis. Competitively priced and exclusively stocked the JWhitaker Golf Shop is the perfect answer for anyone in need of a little Golf retail therapy, serving the Leeds, West Yorkshire area and right across the UK online.